IKEA announced today the 2017 IKEA U.S. catalog, filled with more than 300 pages of tips, ideas and new products for every area of the home, with a particular focus on life in and around the kitchen. Available to the U.S. public starting this August, this year’s catalog is themed “Goodbye expectations. Hello you!” and highlights IKEA home furnishing solutions that help people live a life free of traditional expectations. The new catalog encourages consumers to create a comfortable and secure home according to their own families’ needs and wants. Whether it’s mix-and-matching chairs or serving a fancy dinner without silverware, it’s all about following one’s personal path. To bring this to life, IKEA is releasing a short-form video, “Let’s Relax,” encouraging people to rediscover the simple joy of cooking, eating and being together. The official trailer is live on the IKEA USA YouTube channel, and the full video will be released on Aug. 1, 2016. Because IKEA truly understands how people live at home, the new products and solutions throughout this year’s catalog have many talents. They are designed based on the needs and dreams of real people. From kitchen tables that double as workspaces to sofas that become beds by night, IKEA has developed home furnishings that are as flexible as people are. 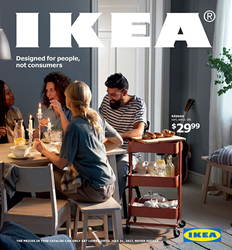 Digital Version (UPDATE: Available starting on Aug. 15, 2016) – Visit http://www.IKEA-USA.com/catalog to view the digital version of the catalog, where users can save their favorite products and create shopping lists. Printed Version (Available starting on Aug. 8, 2016) – Available at your local IKEA store. Catalog App for smartphones and tablets (iOS and Android; UPDATE: Available starting on Aug. 15, 2016)– Download the re-designed and enhanced IKEA Catalog App with richer, deeper and fuller content including videos and features that offer a 3D feeling of the home furnishing solutions, and an augmented reality feature which allows users to virtually place and view nearly 400 IKEA products in their own homes. Additionally, the app can now connect seamlessly with the latest version of Apple TV. NOTE FOR PRESS: Please visit our press site at IKEA-USA.com/2017catalog for downloadable information and assets, including the press kit, digital catalog, images, videos and more. For additional information, product loans or images, please contact us at Kathy.Boerner@Ketchum.com. Join the conversation via the hashtag #IKEACatalog.